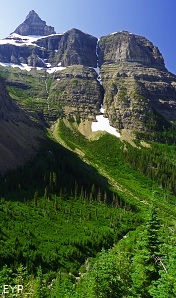 Polebridge - North Fork Area, Glacier National Park. 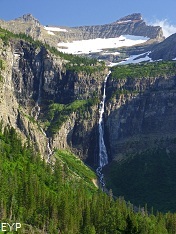 The North Fork Area of Glacier National Park is extremely remote and beautiful. 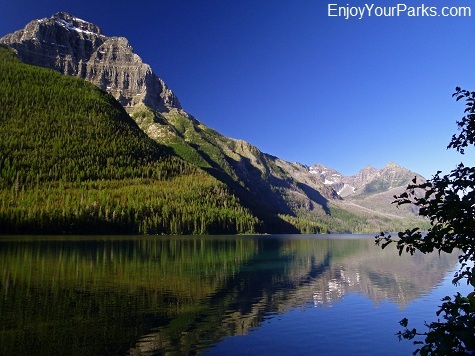 It's so vast and so primitive that we could spend page after page on this incredible place. 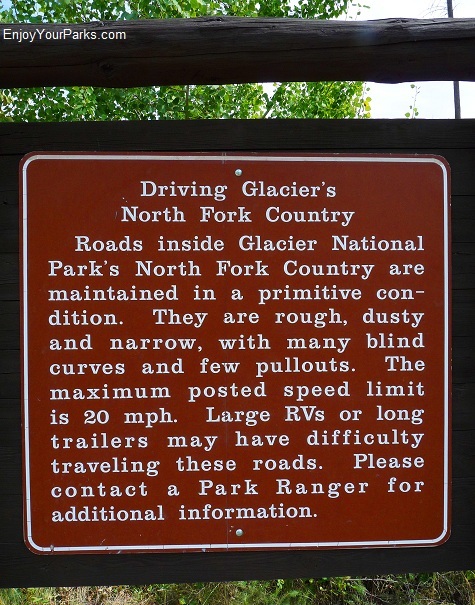 And because the North Fork Area is so "out of the way", most Glacier National Park vacationers rarely have the time to make the long, gravel road drive up here. 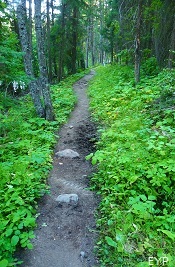 But for those who do find the time, there are many special treats that await them. 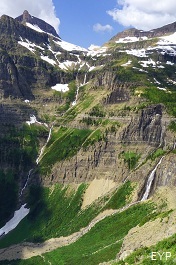 The "North Fork" Area is basically the land bordering the northwest side of Glacier National Park, and it runs all the way from the Camas Creek Entrance (near Apgar Village) to the Canadian Border. 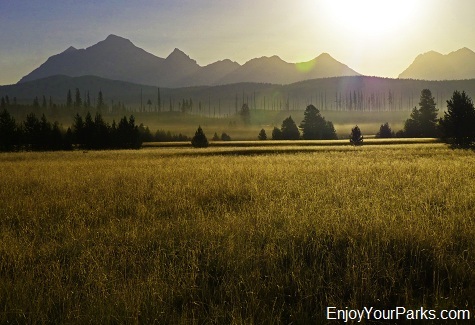 This huge, vast valley of the North Fork of the Flathead River has its own very distinct look. 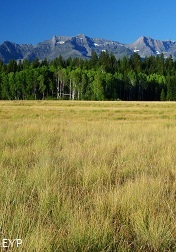 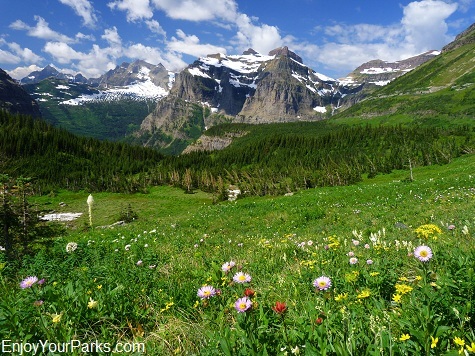 There are large open prairie grasslands intermixed with forested areas, both of which are shadowed by the huge peaks of the remote Livingston Range of Glacier National Park to the east. 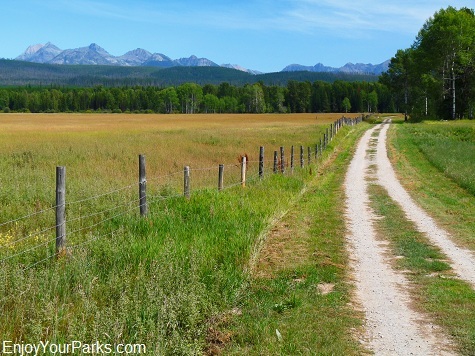 Most of your drive will be on a gravel road, which actually seems to stay true to the primitive feeling this amazing country gives you. 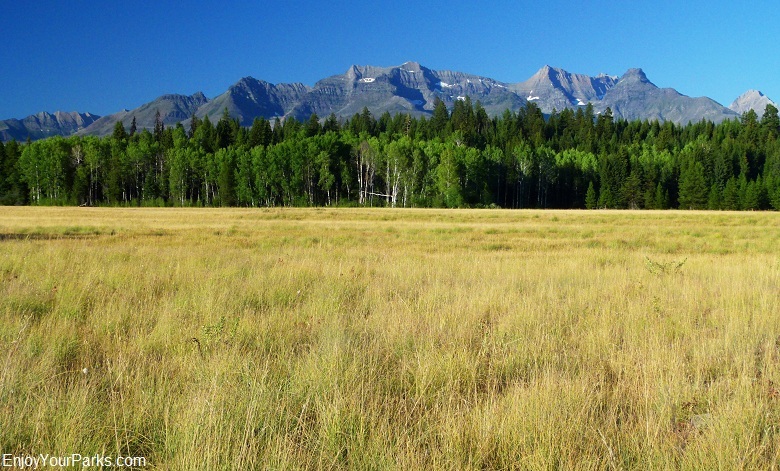 The vastness of the open prairie grasslands of the North Fork Area in Glacier National Park is spectacular, especially with the remote Livingston Range as the backdrop. 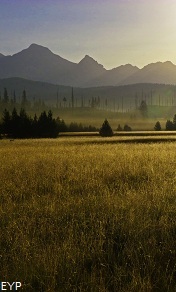 This photo somewhat captures the incredibly magical mornings the North Fork Area often displays for its visitors. 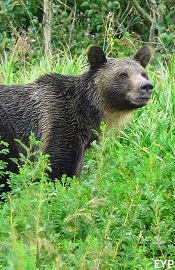 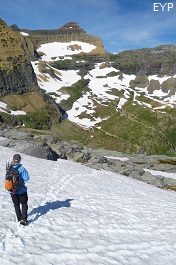 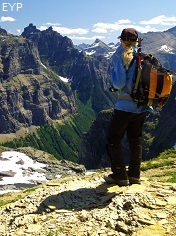 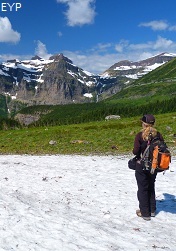 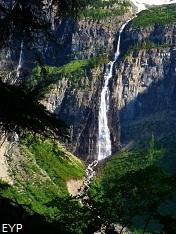 Most backpackers agree that one of the most important features of the North Fork Area is that it is the gateway to the remote Northern Wilderness of Glacier National Park. 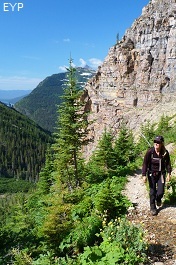 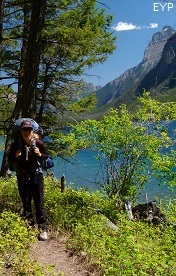 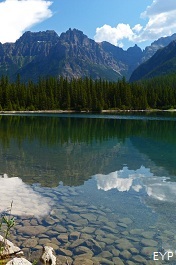 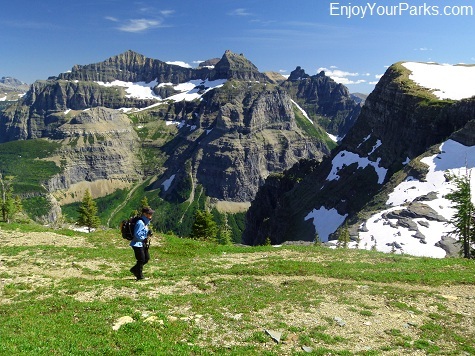 Famous trails such as the Bowman Lake Trail and the Boulder Pass Trail await the eager backpacker, which will take them to iconic places such as Boulder Pass, Brown Pass, Hole In The Wall and much, much more. 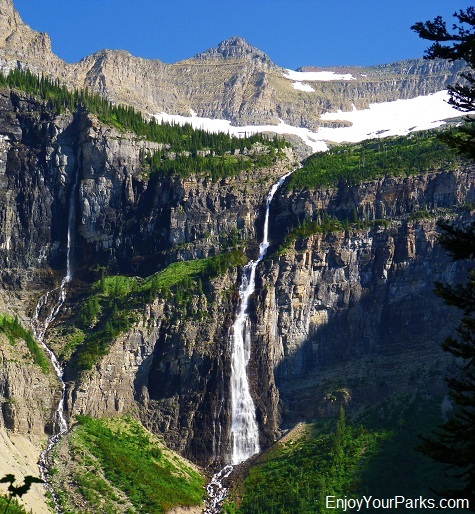 The remote Northern Wilderness is some of the most remote and most beautiful places in the lower 48, and the North Fork Road allows hikers to have access and to explore this incredible country. 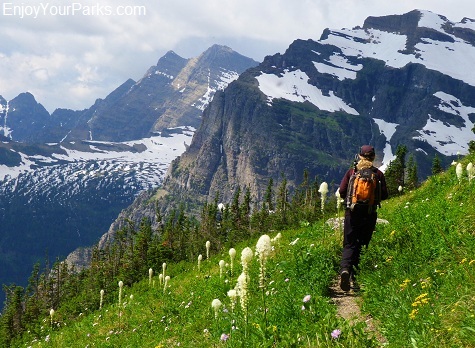 But if you're not a hiker, there are still many beautiful and fascinating things to see in the North Fork Area of Glacier National Park. 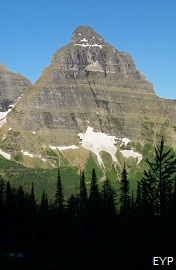 This is a classic view of the North Fork Area in Glacier National Park. 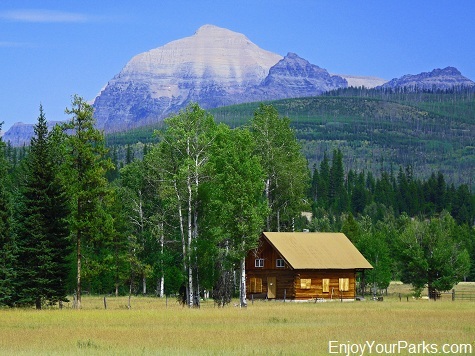 Huge meadows, pine trees and aspens, a gravel road, and the towering Livingston Range of Glacier National Park looming in the distance are the familiar symbols of the North Fork Area. 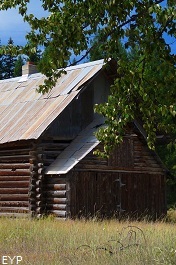 You will see several vintage cabins along the North Fork Road, which only adds to the primitive nuance of this remote area. 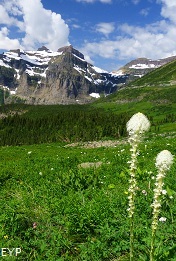 Another classic view of the famous North Fork Area of Glacier National Park. 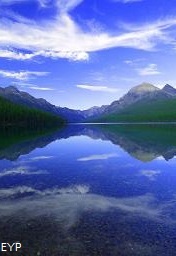 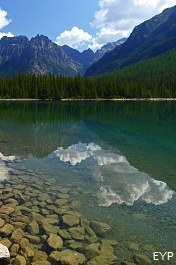 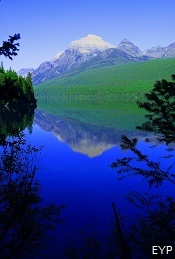 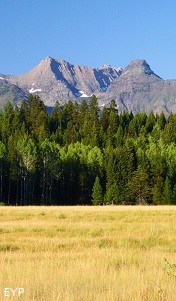 The Livingston Range extends all the way from Lake McDonald to the Canadian Border, and is one of the most remote mountain ranges in the lower 48 states. 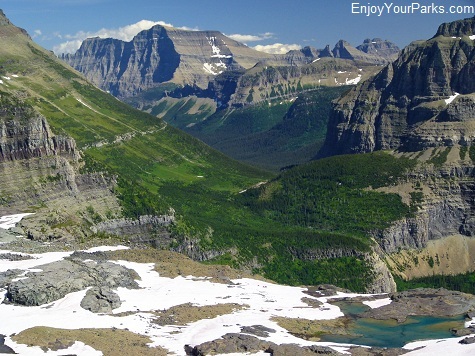 Very few people ever get to explore this rugged mountain range. 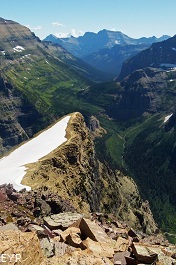 There are actually two roads that take you into the North Fork Country of Glacier National Park- the Inside North Fork Road and the Outside North Fork Road. 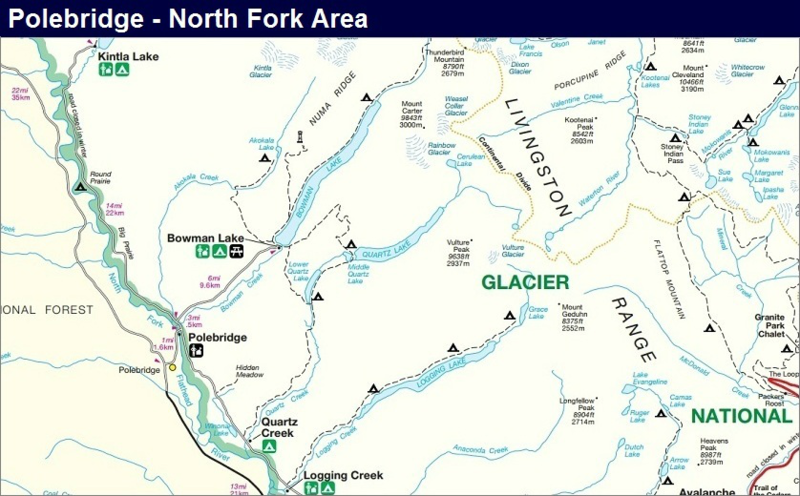 The Inside North Fork Road begins just a few miles north of Apgar Village. 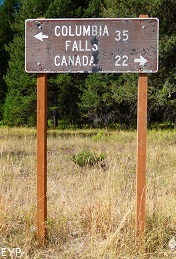 Follow the signs to Glacier Park's Fish Creek Campground, and there you will find the Inside North Fork Road junction. 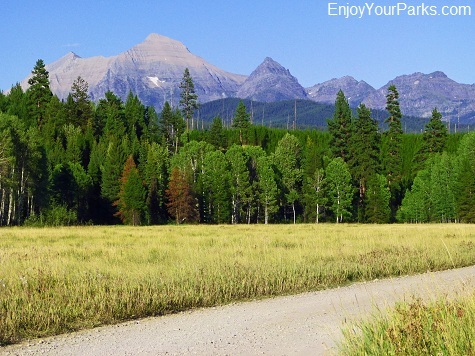 This road takes you along the east side of the incredible North Fork of the Flathead River, and it is inside the border of Glacier National Park. 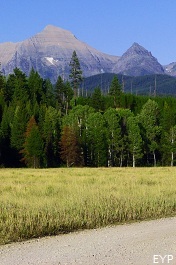 This gravel road is quite primitive, so make sure you ask a park ranger if your vehicle is appropriate for this type of terrain. 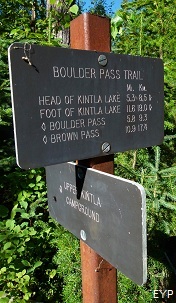 The Inside North Fork Road takes you all the way to the Kintla Lake Campground, which is a whopping 42 rough and bumpy miles! 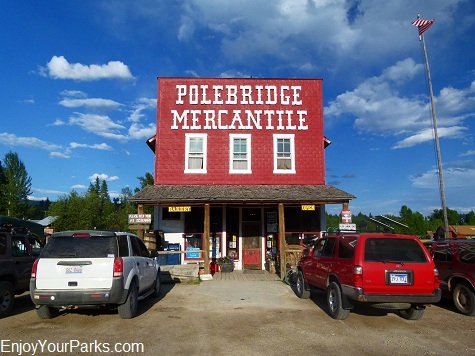 At the 28 mile mark, you will come to the Polebridge Ranger Station and Polebridge Mercantile (just outside the park border). 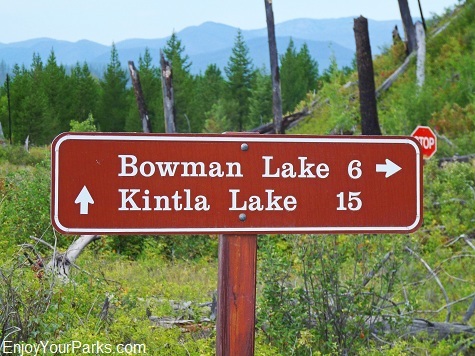 In about 0.3 miles there is a junction that takes you to either Bowman Lake (6 miles) or Kintla Lake (14.5 miles). 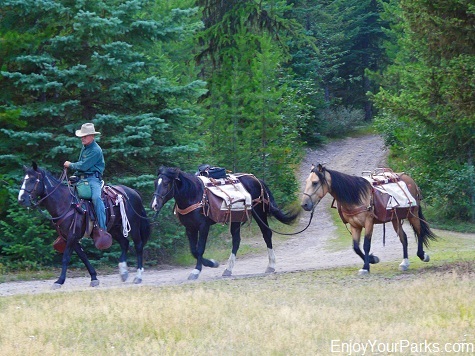 The Inside North Fork Road is a great road to take your time on and enjoy the scenery, and it's also the only way to get to Logging Creek Campground and Quartz Creek Campground, Logging Lake Trailhead, Grace Lake Trailhead. 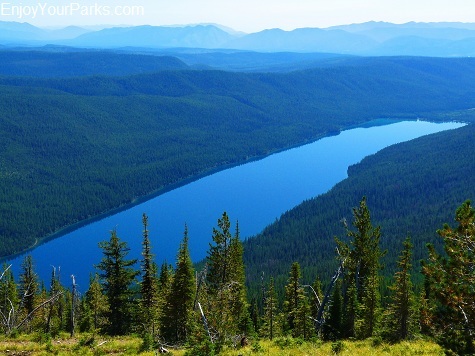 BUT IF YOUR GOAL IS SIMPLY TO GET TO POLEBRIDGE, BOWMAN LAKE OR KINTLA LAKE, YOU'RE BETTER OFF TAKING THE OUTSIDE NORTH FORK ROAD INSTEAD! 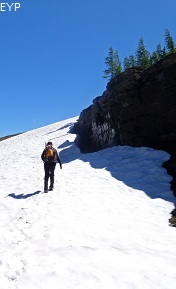 The Outside North Fork Road is a far smoother and wider road that will take you to Polebridge, Bowman Lake and Kintla Lake much faster. 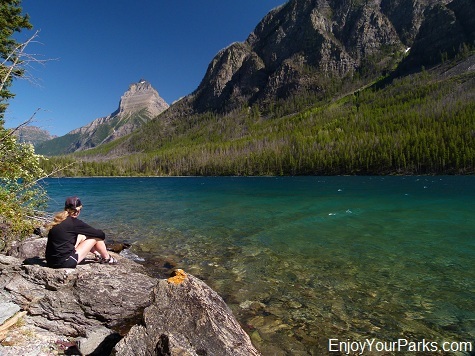 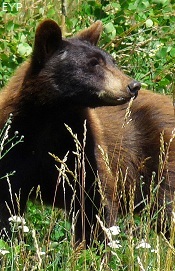 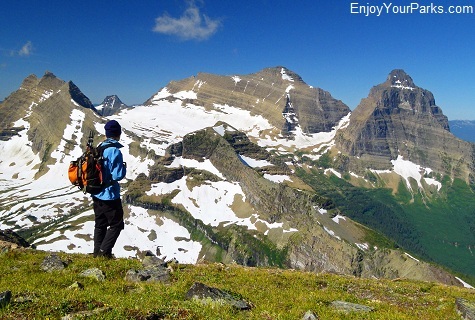 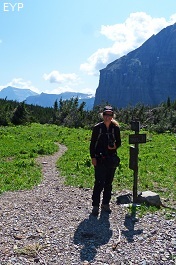 You are just outside the border of Glacier National Park and the scenery is wonderful, with large meadows and prairie grasslands found throughout lush pine forests, and you will get great views of the towering Livingston Range of Glacier National Park to the east. 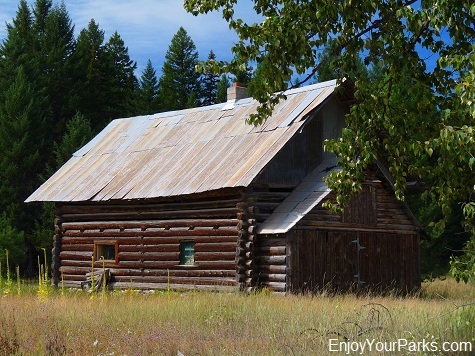 You'll also periodically see vintage cabins that seem to really fit the landscape and give the North Fork Area part of its character. 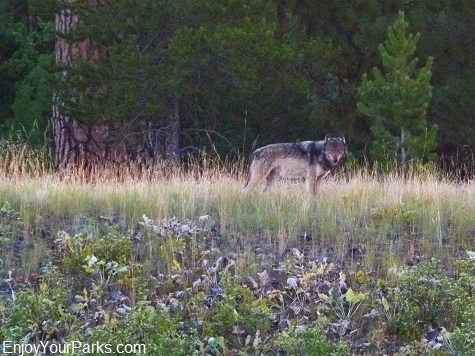 There are a fair number of gray wolves in the North Fork Area of Glacier National Park, however, they are very wary and are rarely seen by visitors. 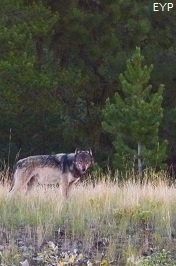 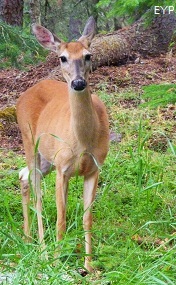 We simply "lucked out" getting this photo just off the North Fork Road. 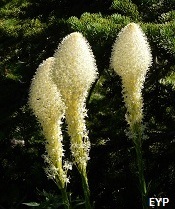 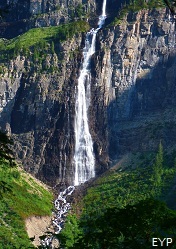 To get to the Outside North Fork Road, from Apgar Village simply take the Camas Road, which is a nice paved road for 11 miles that takes you northward to the Camas Creek Entrance of Glacier Park. 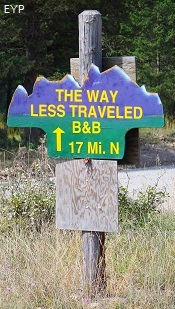 From there, take a right and you're on the famous Outside North Fork Road. 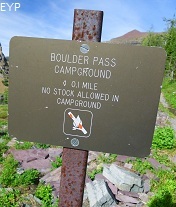 It's mainly gravel, but there is a short stretch of paved surface for several miles just before you reach the Polebridge area. 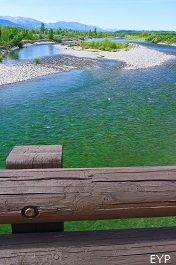 The distance between the Camas Creek Entrance and Polebridge is about 13 miles. 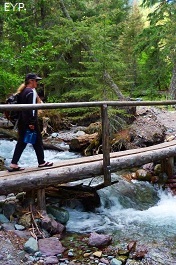 Once you get to Polebridge, the road will take you to both the Bowman Lake area and Kintla Lake area, which are very remote yet popular destinations for visitors. 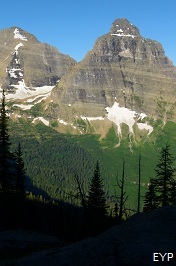 There's something about the North Fork Area of Glacier National Park that gives this area its "feel". 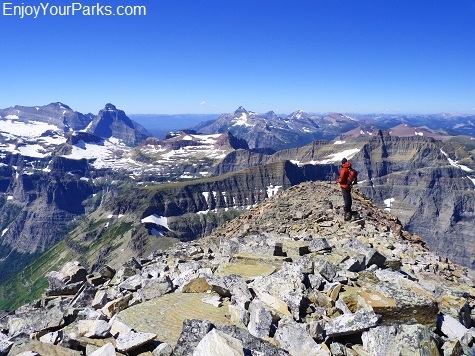 It's hard to describe and difficult to capture with a camera, but once you've been here, you'll understand what we're talking about. 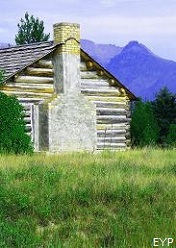 On the Outside North Fork Road you will see flat, open fields that are "prairie-like", with old cabins and homesteads. 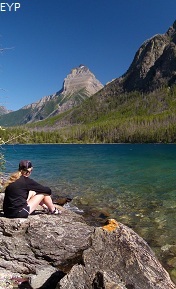 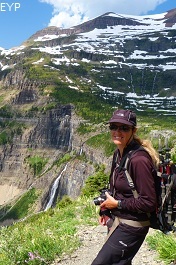 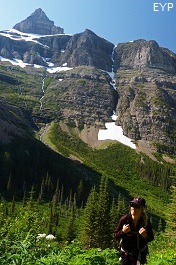 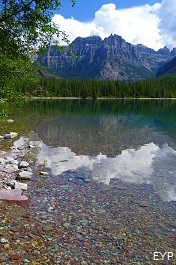 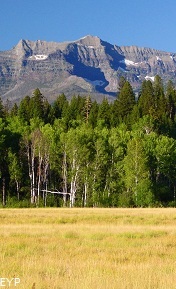 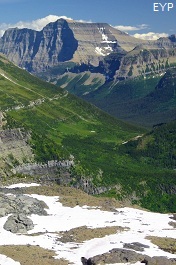 Looming in the background are the remote mountains of the west section of Glacier Park known as the Livingston Range. 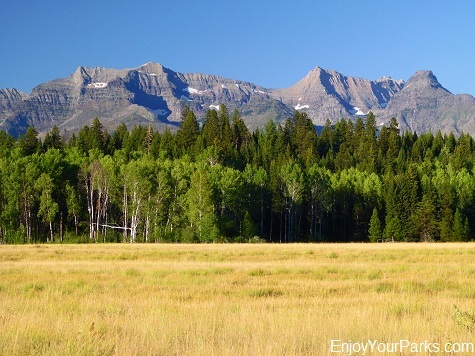 These remote mountains are very majestic as they rise straight out of the flatland, and the entire drive up to Bowman Lake and Kintla Lake provides unique and gorgeous views of these seldom explored mountains. 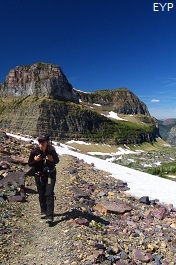 The North Fork Area in Glacier National Park is a very rugged, primitive place that seems to have missed the 20th and 21st century. 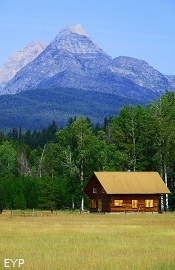 Historic log cabins are located throughout the North Fork Area, and add to the primitive nuance of this remote region of Glacier National Park. 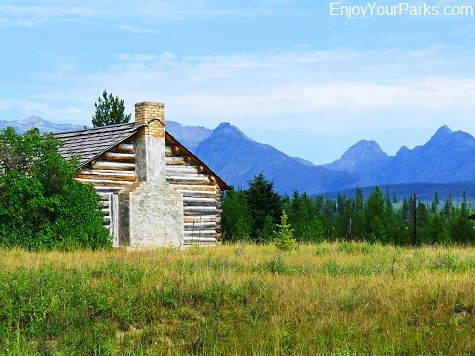 Another old historic cabin found along the Outside North Fork Road of Glacier National Park. 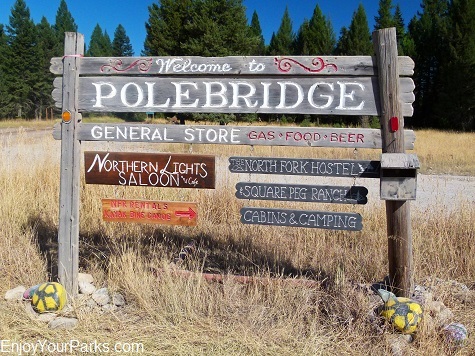 The Polebridge Sign is always a welcome sight! 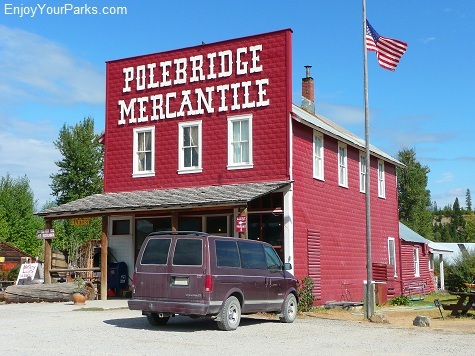 The Polebridge Mercantile is a National Historic Landmark and is a "MUST SEE" if you're heading up to Bowman Lake in the North Fork Area. 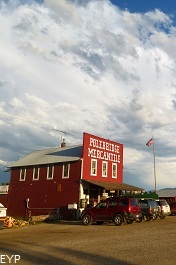 Not only is it a National Historic Landmark, and placed in the National Register of Historic Places, but it is also the best bakery in Montana and beyond. 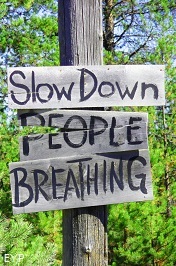 We're not kidding! 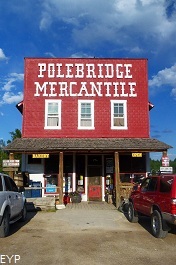 So on your way to Bowman Lake or Kintla Lake in Glacier National Park, stop at the Polebridge Mercantile. And make sure to have a huckleberry bearclaw!!! 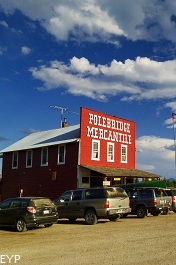 The Polebridge Mercantile is one of the most well-known iconic symbols of the North Fork Area of Glacier National Park. 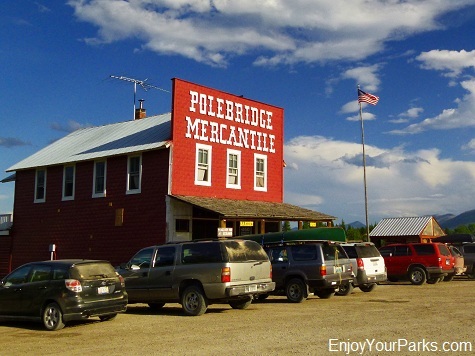 The Polebridge Mercantile has one of the best bakeries in the nation. 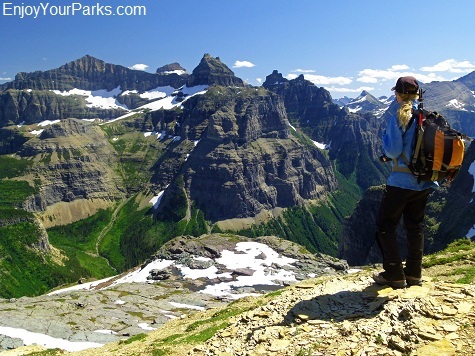 Seriously...we're not kidding! 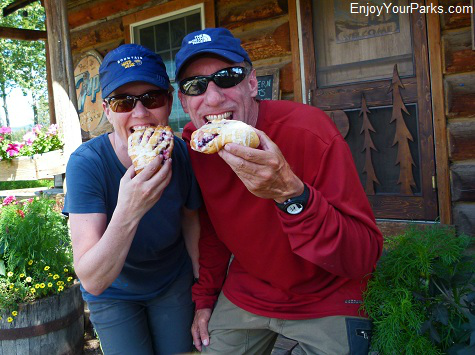 If you've never eaten one of their huckleberry bearclaws, you haven't truly lived!!!! 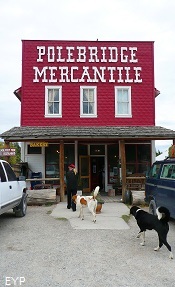 In addition to the Polebridge Mercantile, there is also a wonderful little establishment next door called the Northern Lights Saloon and Cafe. 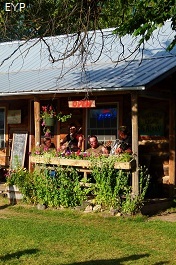 They have tasty meals and occasionally a live "blue grass" band in the evenings. 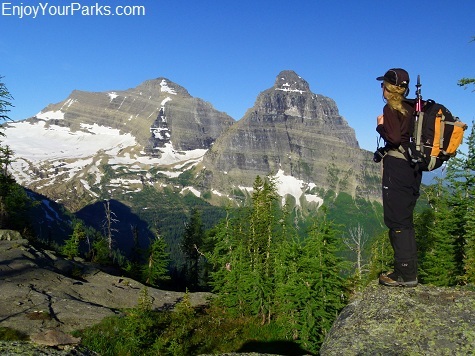 We really enjoy this area after a 6 day overnight backpacking adventure in the Northern Wilderness of Glacier National Park. 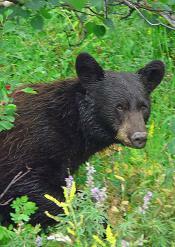 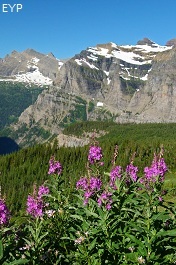 In fact, those "to die for" huckleberry bear claws is all we can think about on the last leg of our journey!!! 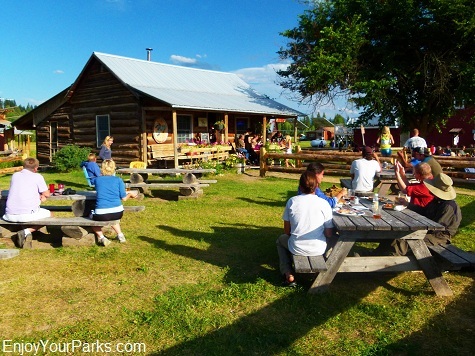 The Northern Lights Saloon and Cafe is a fun place to eat. 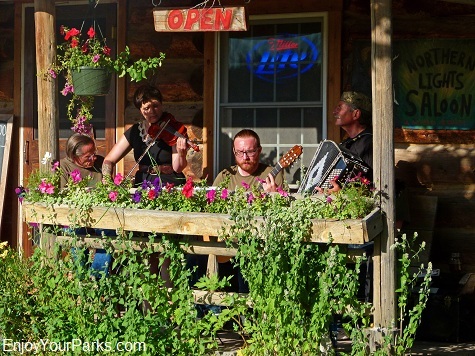 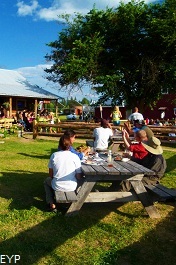 Several times a summer, a wonderful and extremely talented band plays on the porch while you enjoy your meal outside on a picnic table. 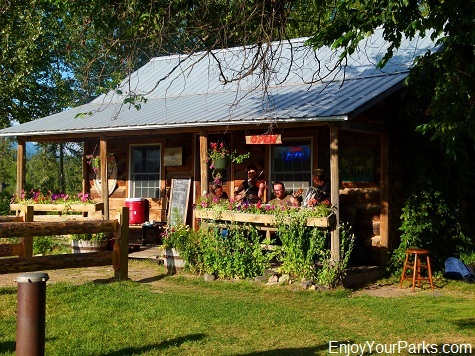 It's great fun to have a great meal and listen to a great band on a warm Montana summer evening at Polebridge in the North Fork Area of Glacier National Park! 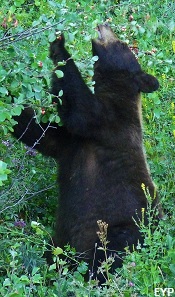 Did we mention their huckleberry bearclaws? 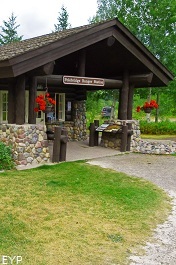 The Polebridge Ranger Station is basically the gateway to the Bowman Lake Area and Kintla Lake Area of Glacier National Park. 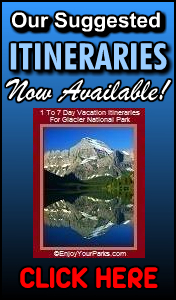 This is a great place to get a lot of great information from the really nice rangers who are stationed here. 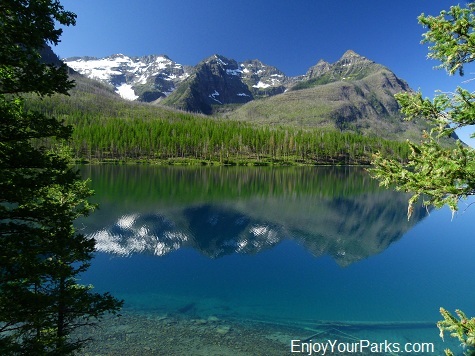 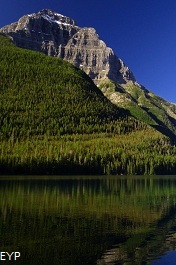 This is also an entrance to Glacier National Park so make sure you have your passes! 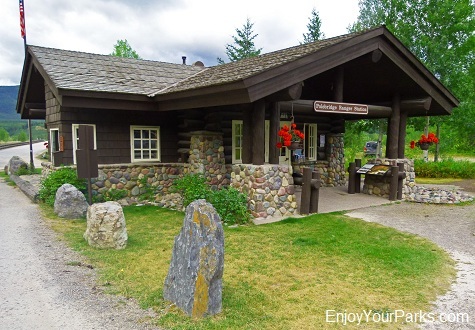 And just before you reach the Polebridge Ranger Station, you will cross the famous "Pole Bridge" that crosses the beautiful North Fork of the Flathead River. 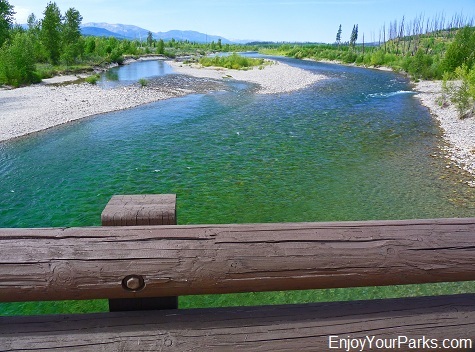 You'll cross the famous "Pole Bridge" that crosses the North Fork of the Flathead River just before you reach the Polebridge Ranger Station. 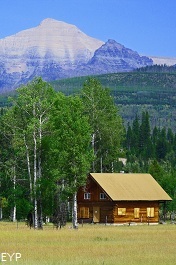 The Polebridge Ranger Station of Glacier Park. 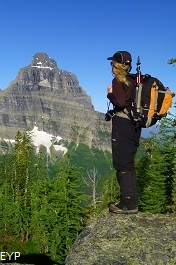 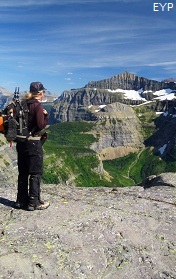 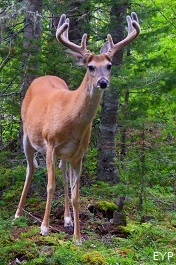 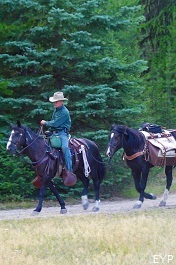 Whenever we have questions about an upcoming backpacking trip in the northern wilderness of Glacier National Park, we always talk to these skilled rangers because they are very familiar with the area and know first hand any snow or water hazards that are of concern along the trails we are hiking. 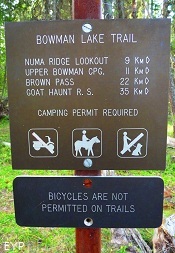 Just beyond the Polebridge Ranger Station (0.3 miles) is the junction for Bowman Lake and Kintla Lake. 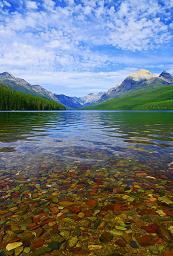 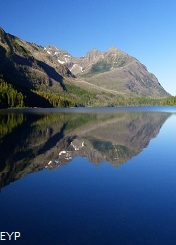 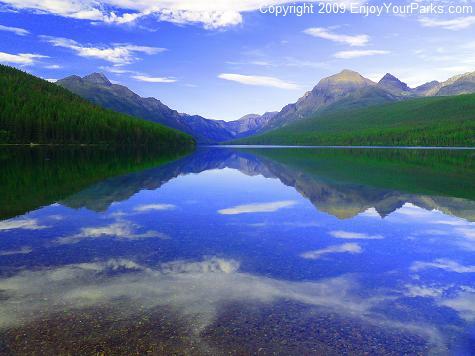 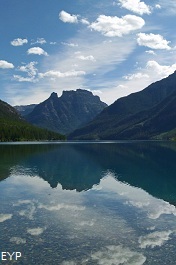 Bowman Lake in the North Fork Area of Glacier National Park is dauntingly captivating, and very beautiful. 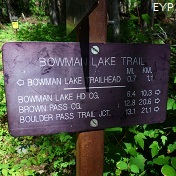 Bowman Lake is about 6.5 miles from the Polebridge Ranger Station, and the road is quite bumpy and very steep in places. 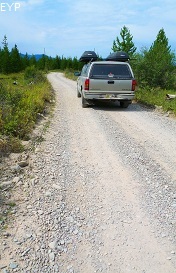 Make sure to ask a ranger if your vehicle is appropriate for this primitive gravel road. 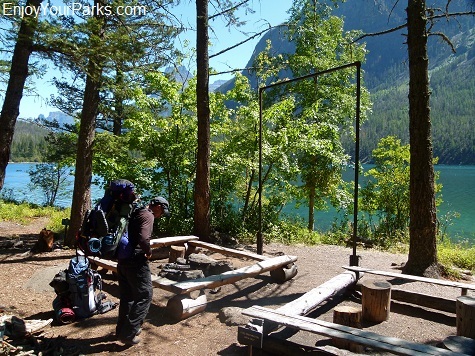 Directly next to the foot of Bowman Lake is the primitive Bowman Lake Campground that we really enjoy staying at before we head out on our backpacking adventures. 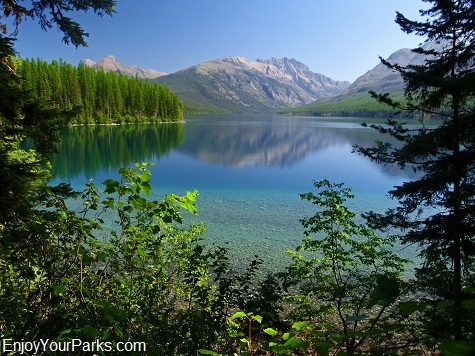 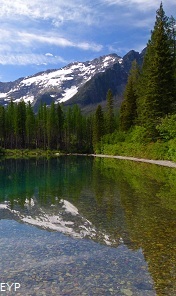 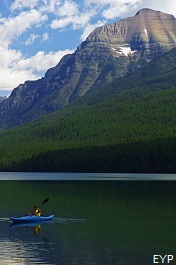 Bowman Lake is about 7 miles long, and the famous Bowman Lake Trail trailhead begins at the campground and takes you beyond Bowman Lake to the famous Brown Pass (13.8 miles) and beyond, into the remote and beautiful Northern Wilderness of Glacier National Park. 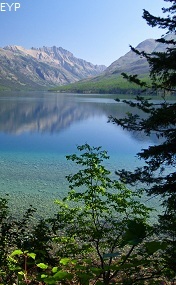 This is a view of Bowman Lake from the Bowman Lake Backcountry Campground (Head). 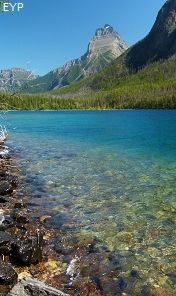 The head of Bowman Lake is about 7 miles from the main Bowman Lake Campground at the foot of Bowman Lake. 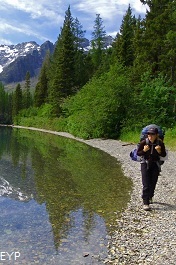 In addition to the Bowman Lake Trail, there are several other day hikes you can take in Bowman Lake Area, such as the Quartz Lakes Loop that takes you to Quartz Lake, Middle Quartz Lake and Middle Quartz Lake. 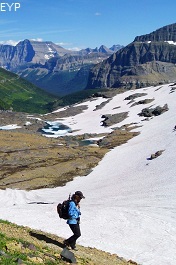 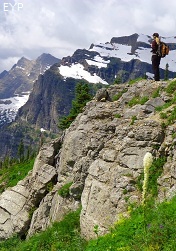 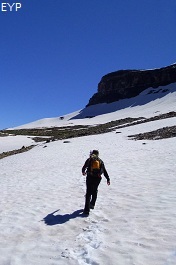 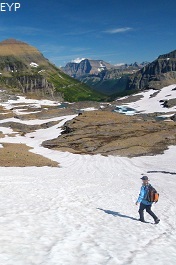 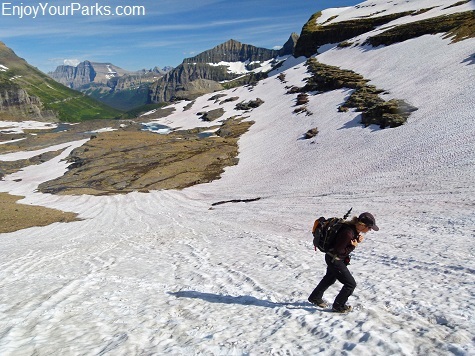 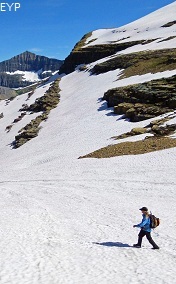 This 12.8 mile day hike has an elevation gain of 1,470 feet and an elevation loss of 1,100 feet, so make sure you're in good physical condition before attempting this Glacier National Park day hike. 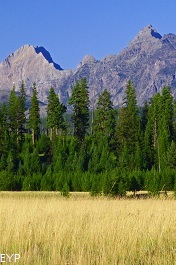 For details click here. 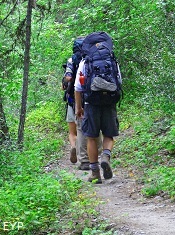 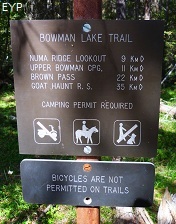 The 5.6 mile hike to the Numa Lookout begins at the Bowman Lake Trail trail head at the Campground of Bowman Lake. 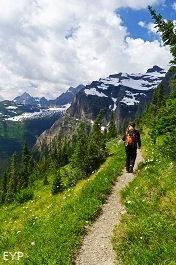 The elevation gain is about 3,000 feet in 5 miles, so you really should be in good physical condition if you plan on hiking this trail. 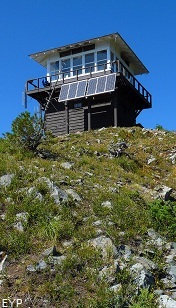 After following the lake shore for a few miles on the Bowman Lake Trail, the Numa Ridge Lookout Trail branches off to your left and heads up to the Lookout. 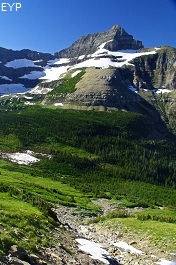 For details click here. 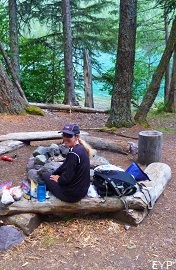 This 5.8 mile (one way) hike to Akokala Lake is a very pleasant hike in the Bowman Lake Area. 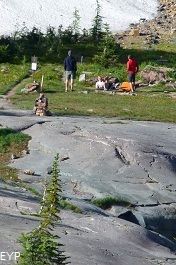 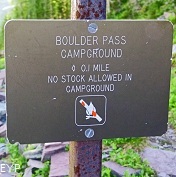 The trailhead is found literally in the Bowman Lake Campground, and it has an elevation gain of 1,105 vertical feet and an elevation loss of 400 vertical feet. 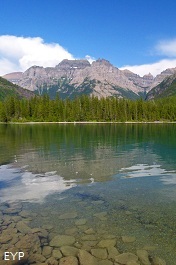 The lake is quite scenic, with remote giants in the distance, such as Kintla Peak. 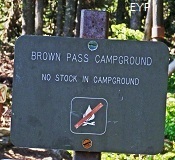 For details click here. 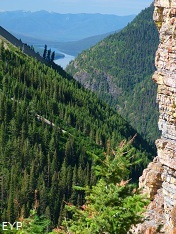 A view of Bowman Lake from the Numa Ridge Lookout in Glacier Park. Kintla Lake of the North Fork Area of Glacier National Park is another "gateway" to the remote wilderness of Glacier National Park. 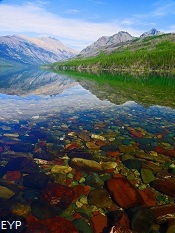 Kintla Lake of the North Fork Area is another beautiful lake that provides access to the remote northern wilderness of Glacier National Park, such as Boulder Pass (17.2 miles) and Hole In The Wall, (19.3 miles), and beyond. 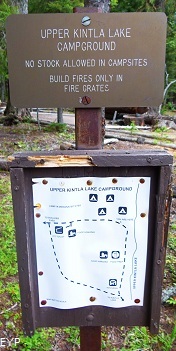 Kintla Lake is located about 14.5 miles NORTH of Polebridge Ranger Station, and the road is a rough gravel road, so again, ask a ranger if your vehicle is appropriate for this road. 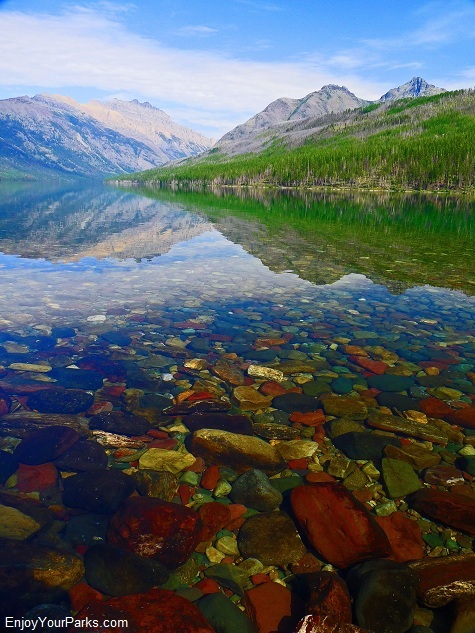 Kintla Lake is approximately 6.3 miles in length, and is the gateway to the great northern wilderness of Glacier National Park. 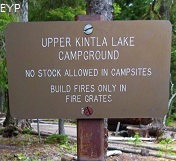 The Kintla Lake Campground (foot) is a primitive campground that is located right next to the west shore (foot) of the lake. 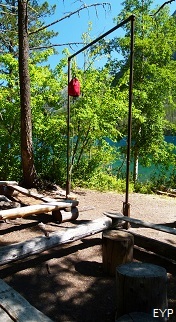 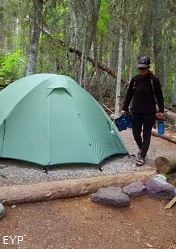 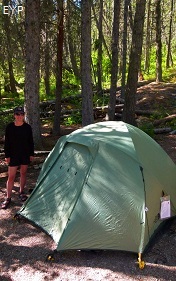 It's a small campground, with campsites separated by logs, but is quite fun to stay at. 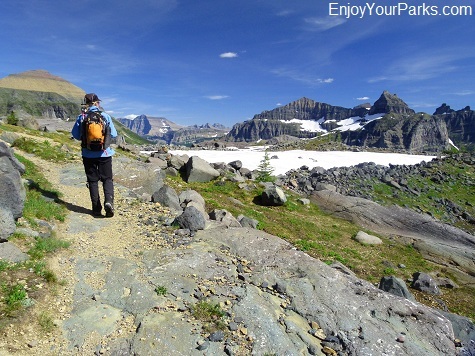 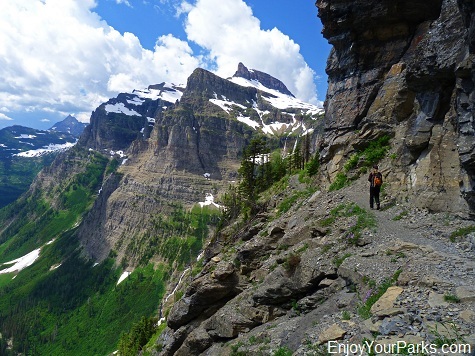 The Boulder Pass Trail is the trail that takes you into the remote and beautiful Northern Wilderness of Glacier National Park. 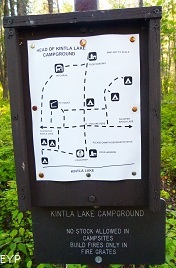 The trail head to the is located at Kintla Lake Campground, where it follows the north shore of Kintla Lake, Upper Kintla Lake, and then on to Boulder Pass and beyond. 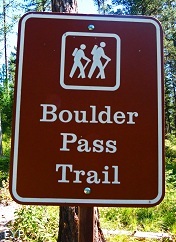 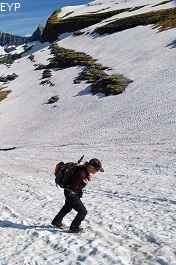 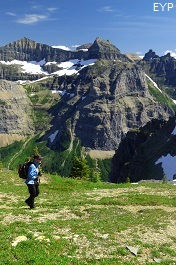 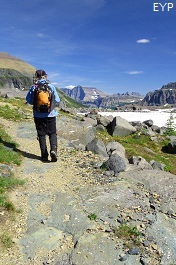 Two of the most popular Boulder Pass Trail hikes originating at Kintla Lake is either the hike to Goat Haunt, which is 31.4 miles from the Kintla Lake Campground (via Boulder Pass and Brown Pass), or you can hike to Bowman Lake Campground (via Boulder Pass and Brown Pass) which is 36.6 miles. 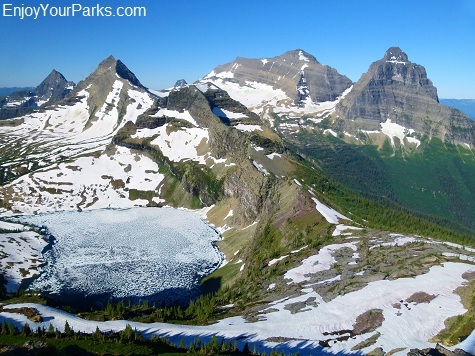 Obviously this remote region of Glacier Park is for overnight backpackers only. 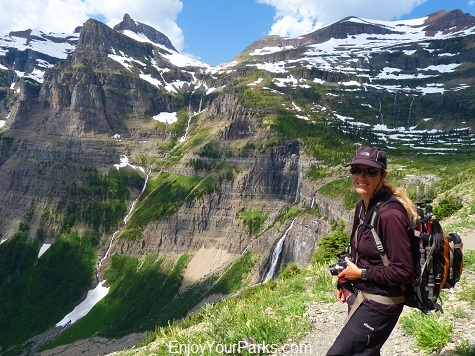 There's really not alot of day hikes available in the Polebridge Area of Glacier Park, whether it be the Kintla Lake or Bowman Lake Area. 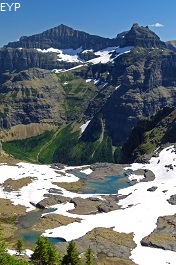 Another gorgeous view of Kintla Lake as seen along the Boulder Pass Trail that follows the north shore of Kintla Lake in Glacier National Park. 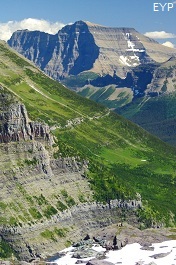 Boulder Pass Overlook with Thunderbird Mountain, Glacier National Park. 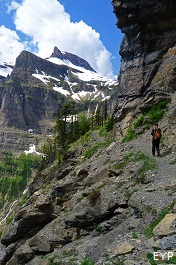 Boulder Pass Trail, Glacier National Park. 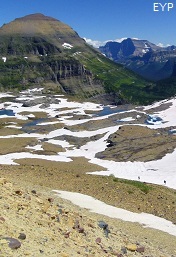 Boulder Glacier, Glacier National Park. 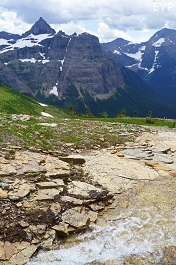 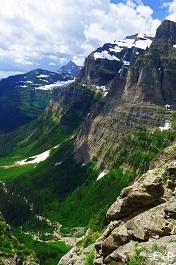 Boulder Pass Overlook with Thunderbird Mountain, Glacier Park. 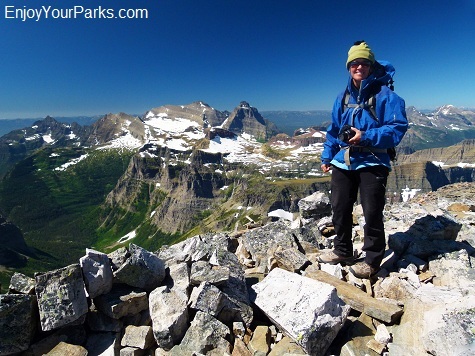 Mount Chapman summit view, Glacier National Park. 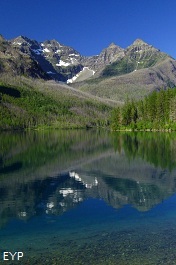 Upper Kintla Lake with Kinnerly Peak, Glacier National Park. 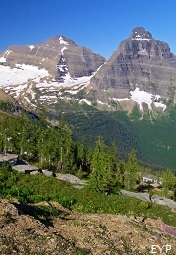 View from Brown Pass, Glacier National Park. 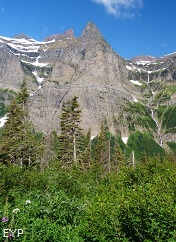 Hole In The Wall Area, Glacier National Park. 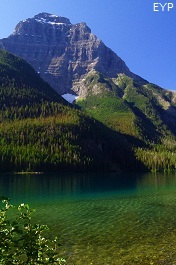 Upper Kintla Lake, Glacier National Park. 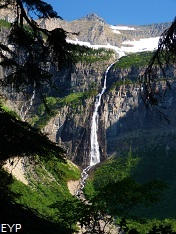 Hole In The Wall Falls, Glacier National Park. 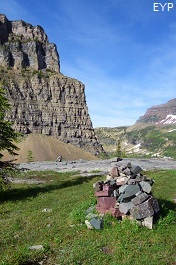 Kintla Lake Campground (Head), Glacier National Park. 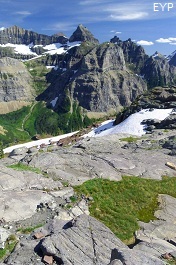 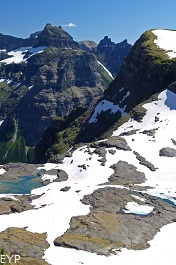 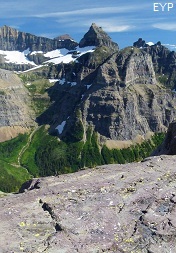 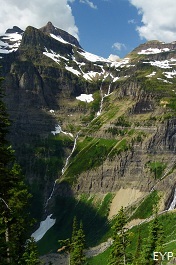 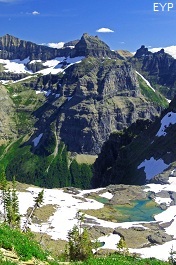 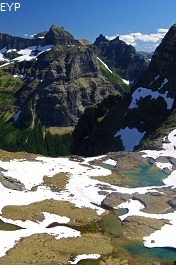 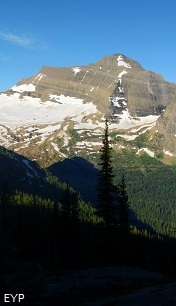 View from Boulder Pass of Mount Cleveland, Glacier National Park. 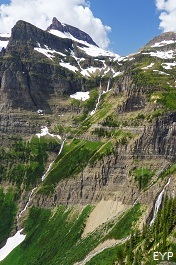 Boulder Pass with view of Kintla and Kinnerly Peaks, Glacier Park. 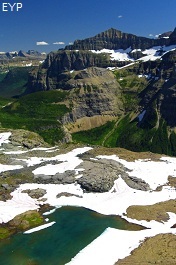 Brown Pass - Hole In The Wall Area, Glacier National Park.